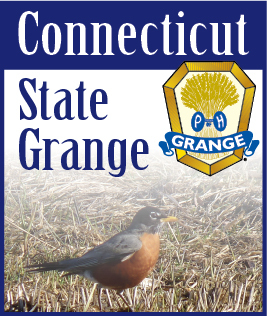 DECEMBER 2007 -- "The Grange is … for people who like to get involved! Projects…committees…community service…contests…fairs…all providing opportunities for leadership, fun, and friendship. Meetings include men and women, good old-fashioned values and activities. We actively participate in many issues related to local, state, and national concerns. Join Today!" The above was written by Karen MacDonald of Redding Grange and was the 2nd place winner in our essay contest. The Grange means different things to different people and next month we will hear from our 3rd place winner. A WORD FROM HOME” CERTIFICATES were presented to the following Granges: Cheshire #23, No. Haven #35, Coventry #75, Totoket #83, Hillstown #87, Ekonk Community #89, Killingly #112, Trumbull #134, Prospect #144, Lyme #147, Enfield #151, Old Lyme #162, Riverton #169, Hemlock #182, and Marlborough #205. SHOULD AULD ACQUAINTANCE” CERTIFICATES went to: Granby #5, Cheshire #23, No. Haven #35, Coventry #75, Colchester #78, Totoket #83, Ekonk Community #89, Beacon Valley #103, Killingly #112, Watertown #122, Trumbull #134, No. Stonington Community #138, Prospect #144, Lyme #147, Old Lyme #162, Riverton #169, West Suffield #199, and Marlborough #205. 2nd – Susan Pianka, No. Stonington Community #138, and, 3rd – Joanne Cipriano, Beacon Valley #103. My thanks to everyone for their help over the last year. See you around the State.